Our volunteers are an integral part of Francisvale. They help with many tasks which can include laundry, cleaning and administration duties. They also help showcase our pets at adoption events. The most important thing our volunteers do for us is give plenty of love and attention to all the wonderful animals at the shelter. They help keep all the animals well socialized so their transition into their forever home is an easy one. We will always be grateful for all their hard work. Whenever any of Francisvale’s animals have had especially sensitive or difficult medical problems, Dr. Orsher and his staff have shown tremendous generosity in helping them make full recoveries. Some of our animals are healthy and happy in their new home because of the VSEC doctors and staff. We are truly grateful. Pals for Life is a non profit organization dedicated to providing companion animal programs to children, the elderly, and mentally challenged. 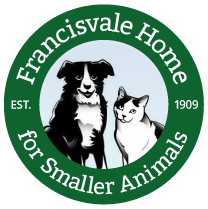 They have been a great supporter of Francisvale and have helped foster some of our kittens and have used our kittens, some of whom have become therapy animals. We can’t thank them enough for their generosity. Mary has showcased our animals is such amazing ways. Her work is impeccable and the animals just practically jump off the page asking for new homes. Her generosity has been so greatly appreciated and we highly recommend her work for anyone looking for an amazing photographer. Ed Foy and his wonderful staff of groomers have been very generous to Francisvale by offering free grooming to some of our messier and more difficult animals. They always know how to handle them with professionalism and a gentle hand. Ed Foy has also referred many of his clients to our shelter when they are in search of a new family member. And we are happy to say we’ve made a few matches! Elinor has volunteered her time to Francisvale by contributing her talented writing skills to the Pet of the Week pieces in the Main Line Times, Main Line Suburban Life, Delaware County News, and the News of Delaware County for Francisvale. Her descriptions highlight all the wonderful aspects of each animal posted and help to find them their forever homes. Dr. Alexander and the staff at the Spayed Club have been so wonderful to all the Francisvale animals that go through their doors. They help keep our medical costs down by offering discounted spay and neuter procedures. Even with the high number of animals they see each day, every animal is well cared for during their stay and they come back to the shelter happy. The Spayed Club staff even takes the time to write down personal notes about each animal. It makes us feel good to know that all of the Francisvale animals are in great hands.